I have been noticing something lately and I am unsure if it has been happening all along and I am just now seeing it or if it is something that is slipping into our ideology. What I am talking about is the ubiquitous use of the term Democracy to refer to our form of government. You can’t turn on the TV or radio these days without hearing the politicians and political commentators spouting about “our Democracy”. These are the very people who should know better. Now before you think that this is nit picking thin about some real examples of Democracy in this country. Think about “separate but equal”, and Jim Crow. These are prime examples of Democracy. Think about a white man on trial for lynching a black man, and even though he was caught red handed the jury found him not guilty, this is Democracy in action, it’s majority rule, its how jury nullification got a bad name. Now it occurs to me to ask why, why do these people want to condition us to believe that we live in a Democracy, moreover why do they want to paint Democracy as something desirable? You should be asking yourself these questions. We do not now, nor have we ever lived in a democracy. Our founding fathers knew that a Democracy was a threat to individual liberty. The word doesn’t appear in the Federalist Papers (our first constitution so to speak), nor does it appear in The bill of rights, the declaration of independence, the pledge of allegiance even correctly defines our form of government…”and to the REPUBLIC for which it stands. One nation, indivisible, with liberty and justice for all.” And no I didn’t forget a line, that line was added in the 50s by congress to rebuke the Supreme Court for ruling against prayer in schools, it was added to essentially guarantee God in every classroom every day. But I digress. As you celebrate our independence from old King George I suggest you think about some things….In this, the land of the free, we have more people in jail than any other country on earth, either per capita or in total, we lead the world in incarcerated citizens, half of whom are there because they smoked a plant., Putting and keeping people in jail is BIG business here, there’s a LOT of money in it specially with privatized prisons. Our educational system is at best mediocre and our kids rank well below most developed countries in terms of math and science education. Our healthcare system isn’t much better, more and more your health is determined by your ability to pay for healthcare. Babies born in the following countries have a BETTER chance of survival than babies born in America: Cuba, European Union, Italy, Taiwan, Canada, Greece, China, the United Kingdom, Portugal, Australia, Luxembourg, Netherlands, Belgium, Austria, South Korea, Israel, Spain, Japan, Singapore, Iceland….and thats just a few…we are WAY behind every developed country on earth. Speaking of freedom I am appalled at the number of people that are ok with building a wall around us, do you REALLY trust the government enough to wall us in? It may keep them out, but it can just as easily keep you IN. It hasn’t always been like this, we were once a world leader, a beacon of freedom, success and innovation. What happened to us? 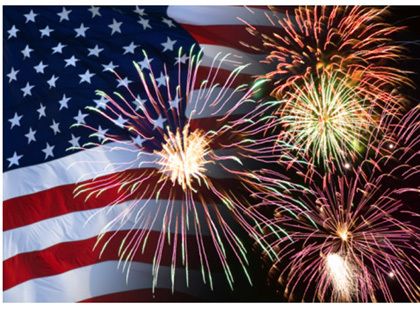 Happy Independence day…enjoy your freedom, because in the name of the war on drugs, the war on terror you wont have it much longer assuming you still do. a bit of irony….notice the number of politicians calling ‘the Republic for which it stands’ a Democracy and pushing to abolish the electoral college. Very true, Lurk. Welcome back.